In this second part of our interview with Akrura Prabhu, we talk about the 40 Habits of a Thinking Coach. Akrura Prabhu: So whenever the lady would come to talk to us Mataji, she would have a box of tissues like 90% of the time at some point the mataji would cry. She would not say anything. She wouldn't preach. She wouldn't try to calm her down or something, she would just give her a tissue. And it helps so much. Krsnendu Dasa: Episode 23 of Successful Vaisnavas. Thinking Partnerships Part 2 with Akrura Prabhu. It's time to get inspired. Join us as we celebrate devotee success stories, preaching business, community development, leadership and personal growth all from the point of view of Krishna consciousness. Our goal, to help you make your life successful. Krsnendu Dasa: Welcome back. In this episode, we'll be continuing our interview with Akrura Prabhu and he'll be discussing about the 40 habits of a thinking coach. Before we jump into the interview, I just thought I'd take the chance right now to ask you. What topics would you like us to discuss on future episodes of Successful Vaisnavas? When I spoke with the Akrura Prabhu recently, he was recommending that rather than just interviewing people, I could also have discussions where you know, I give more of my input. So I really like that idea and I'll be doing that either on my own just discussing ideas that I've been thinking about or I'll be discussing with someone else and having more of a two-way dialogue about topics. So let me know what are some of the topics that you would like to be discussed on Successful Vaisnavas. Perhaps you would even like to be part of the discussion. Maybe you'd like me to interview you or maybe you have someone in mind that you would like me to interview. So please get in touch and let me know so we can tailor the show just for you. Now into the interview with Akrura Prabhu and the 40 habits of a thinking coach. Akrura Prabhu: 40 habits of a thinking coach. Krsnendu Dasa: The basic format as I think you are suggesting Prabhu is that you'll go through these quite quickly, but we might discuss them as we go so that we can just explore these ideas. So thanks for coming back Prabhu and let's get started. Akrura Prabhu: It's nice to be with you again in your podcast for SuccessfulVaisnavas.com. The reason why we are doing this is because Srila Prabhupada said that we want to have devotees who are independent thinkers. And these 40 habits will help to serve devotees in such a way that they can think for themselves. They can use their intelligence better and use their mind better in devotional service. So these are very common sense principles. Many of them you will recognize, some of them you already practice, some of them you have heard of, some of them are maybe fascinating for you, some of them maybe you don't understand. But we will go through them and try to clarify and explain briefly each one of them and if you develop these habits you will serve devotees better in the area of mentoring devoted care, coaching, preaching and supporting devotees in all kinds of ways. Akrura Prabhu: Number one stay focused on what person speaking to you is saying rather than rehearsing your response. Now, I believe that when you hear them Krisnendu Prabhu you will also have some maybe thoughts and please feel welcome to comment. Akrura Prabhu: Anytime, anytime you feel. Okay, so we go to number two, be interested in exploring different ways of looking at the same issue. Krsnendu Dasa: This is quite a big one I think in our society because we have quite a dogmatic viewpoint sometimes that we have a feeling that there's one right way that you know that Prabhupada would have wanted this or this is the right understanding and it can be quite a challenge to open our thinking, you know to look at things in a different way sometimes. Akrura Prabhu: Right, right. Well, I would say explore different Krishna conscious ways of looking at the issue. Akrura Prabhu: And regarding the first one again if you understand that your service in this approach is not to respond, but to actually stimulate their thinking then number one wouldn't be a big problem. So stay focused on what they are speaking to you rather than thinking about what will you reply to what they say. Krsnendu Dasa: I think it's quite liberating also actually that concept because if someone is thinking that when someone asked me a question or they're talking, I've got to come up with an answer or something. It's putting kind of pressure on yourself. Whereas if we have the faith that the person has the truth within them and we can just be there to listen and try to understand. Krsnendu Dasa: It's takes away a kind of a pressure that we're putting on our self that "Ah. Oh yeah, I'm the guru or I'm the coach or I'm the whatever and I need to respond or something". But if we push that away and just say now all I have to do is just listen and try to understand, yeah it's a starting point. That makes it a lot easier. Akrura Prabhu: That is a beautiful point. This is a new insight for me. I'm glad this is being recorded. I'm going to write this down. I am always thinking how it will be easier for the client. But actually it's good to make it easier for the coach too. Okay number three, turn off phones, laptops, the TV, mobile phones and all kinds of distractions when meeting with people or talking with them. So this one is quite clear. But the point is to really do it, not just agree. Akrura Prabhu: Number 4, consider everyone your equal as a thinker. So we already spoke about this in our first podcast. Akrura Prabhu: Then we believe that the super-soul is in the person's heart and even if it was covered by ignorance, but the super-soul can also inspire them and inspire their intelligence and they can come up with amazing ideas. When I was doing non-directive coaching or trying to do non-directive coaching in the past I have seen how devotees have come up with ideas that I could never come up with. I was so happy. I was just jumping up. Number five, stay aware of your reactions at the feeling level to whatever is being said to you. Now this so good to have in life, you know how you react from within and what you feel about what people say. Someone might say something disturbing. So, how do you feel, how do you control this? How do you choose your reaction? So also observe how do you react and how do you feel about what the person is saying. Now before we move on I would like to mention something that I forgot to say in the first session and you actually mentioned part of it is that in this approach coach is called a thinking partner and the client is called a thinker. Akrura Prabhu: So from now on when I refer to a client, I will say thinker and when I refer to a coach, I will say a thinking partner. Is that okay? Krsnendu Dasa: On that number five, the one that you've just spoken about the being aware of your reactions at the feeling level. I was recently at a parenting course just this weekend and they were talking about the importance of reflective listening to really trying to understand from the other person's point of view. And one of the points that came up was that it's more difficult. Because we're talking about parents like so if a child is having trouble at school, then you go up to them and say oh you look like you're a bit down and you just sort of open up the opportunity for them to share and then you say oh so you're feeling like this and feeling like that and the point that came up is that if their strong feeling is towards us, like as a parent, it's much harder to do that sort of objective reflection because our feelings get invoked as well. It could be between the husband and wife. It could be between the children. But just when I saw this, it just reminded me of that point that we need to honor our feelings and things like that. But we also get to choose how we respond to them. Akrura Prabhu: Yes, right. Okay. So let's go to number 6, share as much accurate information as you can to support the thinking of those around you or the thinker who is in front of you. So we explain this in the first part about sharing information. Sometimes just because of lack of information the thinking of a thinker is limited. And this mean to teach. It doesn't mean to take an opportunity to take advantage of this now speak for a long time, but just briefly share some information with this that will help with better thinking. Krsnendu Dasa: Yeah, I can imagine like in a situation where someone has observed something and they have jumped to a conclusion about someone or the situation, but with a little bit more information, they might see it in a totally different way. Akrura Prabhu: Okay number 7, take control of your time and energies so that you are not unduly rushed. So take time, like one hour for a session or half an hour, whatever your time you have but within that time you are not rushed. When I was giving a seminar recently some devotees were joking that oh, I have all the time you want within one hour. I have all the time you want for you within one hour. But it's nice because you know you are fully present. Akrura Prabhu: It's not just joking, but it's actually you are fully present for them. You are there for them in that hour fully hundred percent, hundred and eight percent. Krsnendu Dasa: Yeah, yeah. And I guess it's the way you frame it as well, it's like we have a whole hour here. So I'm in no hurry... It's a good way to frame it rather than all that, we've only got an hour so you better get moving. Akrura Prabhu: Number 8, operate on the basis that better than does not necessarily mean the best. Akrura Prabhu: Something can be better than something but it doesn't necessarily mean it's the best. So this, now this can be explored . So this has to do with comparison, comparing yourself with others or with yourself. And so one can think what will be the best? Krsnendu Dasa: Yeah, I like that. Akrura Prabhu: Number 9, treat feelings as facts requiring serious consideration. Krsnendu Dasa: Can you repeat that one? Akrura Prabhu: Treat feelings as facts requiring serious consideration. This is a tricky one. Yes, please. Krsnendu Dasa: Oh, just the idea that feeling they shouldn't be discounted, but they should be honored as important. Akrura Prabhu: Yes. Seriously, honored even if they may be like sometimes devotees say oh that's so sentimental. Yeah, that's sentimetal but this is my sentiment that I can't help it. I'm completely overwhelmed by this and I need to express it or speak about it. Akrura Prabhu: So taking feelings seriously and allowing expression of feelings. Ten, refrain from telling people what to do and how to do it. Now this is a more general instruction because the thinking partner normally wouldn't do that, anyway. Akrura Prabhu: 11 ask more questions of people than you offer solutions when they have a problem to solve. Akrura Prabhu: So when somebody comes to you and say I have a problem, what do you think? And can you help me? And the first question you can ask is have you already thought about the possible solutions? Have you thought about this? And if they haven't, I have something from Brian Tracy, famous success teacher, asked people to write down 20 ideas how to solve a problem or achieve a goal. So he asked you to think on paper. Thinking on paper can be can be much more effective than just thinking aloud. So, sometimes it requires them to think very deeply because they will write it down and see there just in front of them, black and white and it will be easier for them to understand how real it is. Number 12, ensure that people around you get an equal opportunity to speak. Now this is especially relevant to meetings. Because as you know, as we know, in meetings some people speak too much and some people speak too little or don't speak at all. Akrura Prabhu: But with this thinking approach you want everyone to say something and they have a certain amount of time and they will be listened to and they will not be interrupted. Number thirteen, see the views of people from different fields or backgrounds before making important decisions. Krsnendu Dasa: Yeah. That's important because there's a tendency to associate with people of a like mind and if we keep always sort of getting the point of view from them, it can become like a group think where we also think in a similar way and getting input from people that have a different, see it from a different angle can be really helpful. Akrura Prabhu: M-hm. So this is one of the principles of a mastermind group. Akrura Prabhu: Where people come with the attitude of valuing differences, valuing opposition, they're not afraid to be challenged. Akrura Prabhu: 14, encourage others to consider alternative possibilities in their thinking. 15, take time to think as a matter of course. Now some people might not understand, which are not English speak like native English speaker what this is. As far as I understand, you can correct me, take time to think as a regular habit. Krsnendu Dasa: Yup, that's correct. Akrura Prabhu: So take some time to think daily or weekly and just be in a quiet place in for yourself or take time to think in the presence of a friend who is willing to facilitate your higher quality thinking. You can have regular sessions thinking sessions. Krsnendu Dasa: Yeah, it just reminds me like what you're talking about with the coaching partnership is an obvious structure for helping with the thinking. There's a popular book that came out recently called Deep Work by Cal Newport and what he recommends is to go for a walk and only think about one particular thing and it's a way of focusing the mind. So it's a specific skill of thinking but like if you have a particular, one particular problem or something you want to work on, he said you go for a walk. You don't take your phone or any... don't go with anybody, but just walk with only that idea in mind and just you know, try to keep in mind just on that one thing. And he said it was a very powerful way of developing the thinking muscle as well. Akrura Prabhu: So this is great. Yes, this is wonderful contribution to this whole process of facilitating better thinking. Now facilitating better thinking is not limited to these 10 components. And as you said now I have personal experience also, I can confirm that walking makes me think better, especially walking in nature. Akrura Prabhu: So we recommend also it can be 40 first habit of walk and think. So this is, thank you so much, this is wonderful. 16, tell the people around you what you appreciate about them. This will help their thinking, appreciation and we already spoke about this in our first part. You know, we don't do it enough. We do it too little. So I recommend like 12 compliments a day, for example to your wife or kids. Akrura Prabhu: It's basically every hour like from 8:00 to 8:00. Krsnendu Dasa: Yeah, I mean just like the six gosvamis, right? It says sankhya purvaka nama gana natibhi or something like that, excuse my Sanskrit. But sankhya. It means a counted number. They would do obeisances a certain number of times each day. Just like they'll do a certain number of rounds every day like we also do. They would also offer obeisances a certain number of times every day. In a way, that's a type of respecting and appreciating too I guess. But there's nothing wrong with making a number like that. This is what the Goswamis showed by their example, and that's the way that we can develop the habit by just doing it by numerical strength. Akrura Prabhu: Choosing your number for a day, you can be 12, it can be see...When I said to some grihasthas 12, they say, oh, that's too much. So then I said six choice, six compliments to your wife. Or six hugs a day or 12 hugs a day. It can be expression of appreciation but it can be also expressed, it can be expression of love. Krsnendu Dasa: Yes, that's correct. Akrura Prabhu: 17, express your feelings about issues as well as your thoughts. So this is the advantage of the thinking section where they can express what they think, they can express what they feel. Nobody will judge them. Nobody would interrupt them unless it's something extreme, you know, like planning to commit suicide then you will just listen. Krsnendu Dasa: Yeah this is something.... In our society that you've mentioned earlier on there's a tendency to minimize feelings that are you know, we have to be philosophical and you know, don't be sentimental and things like that but feelings are a very important part of our whole being and they need to be honored. Akrura Prabhu: Yes, we have a tendency to neglect our feelings fearing that they're immaterial, sentimental. Akrura Prabhu: Keep your eyes, number 18 keep your eyes on the person who is speaking. If you are, you know, Facebook or video. Akrura Prabhu: So that's clear. So we are at half of the habits and moving at the half. Krsnendu Dasa: Yeah. It's great, keep going. Akrura Prabhu: 19, ensure the decisions are made on the basis of what is known to be true. This is for meetings, for groups. Now at the moment, I'm not studying this very much and not practicing so I can't say much of this. Akrura Prabhu: 20, make a conscious effort to rearrange your physical surroundings to make them more conducive to relaxed thinking. So we spoke about this in our first session how to make a nice space, nice atmosphere with no interruptions. Not too cold, not too hot. Nice smells, nice lighting. And then also make sure that person is not in physical pain or that we are not in physical pain. So things like that. Krsnendu Dasa: Yeah, I would add something to this as well. There's a book recently that's come out which I like called Willpower Doesn't Work and the whole premise of the book is that just trying to force yourself to do something different doesn't work because our environment is what makes us do things the way we do them. So the way to actually change is to change your environment, and by changing your environment you change your results. And one example that he gives in that book or suggestion is that we go to a specific place for a specific type of work or a specific type of state. So for example, when we're at home, there's a certain mood there. But if we wanna be really focused we might find that it's better if we go out to the park, we go to the library or go to a different place that's more conducive for that type of work. So I think it can be like that as well for this specific type of thinking that if we go to a different place than our regular place, it also allows us to... The novelty or something can help us to think better. Akrura Prabhu: Right, if you really want to think better we can ask ourselves regularly, "What kind of environment will help me think better?" If we don't have a thinking partner, we can try to create better environment for our thinking by walking outside in nature, by going to a more peaceful place, by not bringing the phone with us, maybe or... I mean bringing a phone can be helpful actually because you can record your thoughts. I do this. Krsnendu Dasa: Yeah, yeah. It's like thinking on paper or thinking into the microphone. Similar, yeah. Akrura Prabhu: Yeah, it can may be helpful, but I don't have internet always with me, internet connection. So it doesn't interrupt my thinking because I don't see messages from others. I just use the recorder so... Well things like this we can think okay, "What will help me think better?" Some people reflect to think on paper. Akrura Prabhu: And they come up with the you know, you have heard about the technique called free writing. Free writing is also thinking on paper and putting down your thoughts. So there is many things we can do to help our own thinking, the quality of our own thinking. 21, encourage others to be themselves and not to conform to your way of doing things or particular way of thinking. Now this one is tough in ISKCON because many times we have people who are right or who think they are right. or they want to impose their way of thinking or because something is sastric then they. No, it sounds like sastric. They think they are always right. But there is time, places, circumstances and the persons involved so I think we need to encourage people to use their free will more and to not just blindly accept what you say just because you're senior. Akrura Prabhu: 22, challenge others to question their own assumptions. To me, this one is one of the most important and it has to do with incisive questions. Akrura Prabhu: To challenge our own assumptions. We want to challenge our own limiting assumptions and we want to transform them, we want to turn them into liberating assumptions. Akrura Prabhu: 23, look for ways to build the confidence and self-esteem of those around you. So now we want to do it in a Krishna conscious way. We don't want to pump up somebody's false ego. But we want them to build their confidence in Krishna and to respect the fact that they are part of God, that they are spirit-soul, that they are asharyavat or amazing. They have potential, that this potential is now covered. And by the process of Krishna Consciousness, this potential can be released. So we want to Krishna conscious way to do this not some image way or some mundane way. 24, maintain your confidence in the presence of people in authority or more senior than you. Now maybe it's not easy to understand this that don't allow presence of people you may be afraid of to stifle or to limit your thinking. I have seen it, I was very fearful in the beginning because devotees seemed superior in all ways and then you know, when sometimes senior devotee or spiritual master would ask I would almost never try to answer because I thought I'm stupid, I'm materialistic. But other devotees, they actually volunteered to give an idea or to answer and then I somehow guru was pleased because they were thinking more clearly and they felt room to think. But I was this, you know lack of confidence and fearfulness. I didn't say anything. Krsnendu Dasa: Feeling intimidated. Yup. Akrura Prabhu: Just feeling stifled by my own fear. Just this negative self-talk. Akrura Prabhu: Negative self-talk limits our thinking and stifles our intelligence. 25, remain mindful of your own physical comfort needs when meeting others. This refers to a thinking partner or coach that you also have to be in a situation where you can think well. Even though you are listening more and you are not a thinker you're a thinking partner, but still important for your concentration, for your focus to be able to have a good environment for your own thinking or for your listening. Akrura Prabhu: Physical comfort. 26, allow people to finish their own sentences rather the jumping in to finish them on their behalf. Krsnendu Dasa: Oh boy. I've had a bad habit of that one for sure. Akrura Prabhu: You see I also feel bad when I hear this because maybe we think we are helpful. We want to help them, they're struggling to fill in the sentence. We help them, we have done a good deed. But here this is discouraged. Let them think. Silence is a tool...feel comfortable with silence. Akrura Prabhu: 27, tend to notice what is already good in a situation as well as what could be improved? Akrura Prabhu: This is a bee mentality as opposed to fly mentality. But doesn't mean become blind. We also see what needs to be improved, but we want to focus on what is good. There is an another technique called appreciative inquiry where all the questions are based on seeing what is good in the company, in the situation, in the organization, the team and then they ask questions based on this. They don't think like this is their main focus. Akrura Prabhu: 28, recognize and attempt to minimize competitive behavior between friends and colleagues. So opposite of competitive is cooperating. Akrura Prabhu: This is good for meetings or working with teams. 29, hold back from trying to solve other people's problems. So this is similar as the previous point that resists of giving people solutions. But ask them questions and help them to think about how to solve their own problems. Akrura Prabhu: 30, encourage others to challenge your point of view. Now to do this you have to be very courageous and you have to give up false ego. Check your ego at the door. Krsnendu Dasa: Yeah, definitely. Definitely it requires courage. Akrura Prabhu: Srila Prabhupada would sometimes asks there, he would say something or propose something and he was asked his disciples, "What do you think?" And then sometimes some of them say "Oh, well, it is not a very good idea" or "I have a better idea" or they would say something that is a better idea. So Srila Prabhupada would encourage others to express their point of view. And here it says even to challenge our point of view. Akrura Prabhu: 31, actively encourage others to say what they really think. It's nice. 32, make time for others when they need to talk. I like this one. Usually we are in a rush. You don't have time to listen to people we say are important to us. And when you say this, then I don't believe you, I'm important to you. Krsnendu Dasa: I think this is an important part of Lifestyle as well that we want to arrange our life that we're not so busy but then it's hard to find time. If it's possible to arrange our life in a way that we be can be a little bit flexible so that when we need to meet with people we can do it. I think this helps. Akrura Prabhu: Do you have three children? Akrura Prabhu: Do you ask them from time to time "What do you think about this?" Krsnendu Dasa: Yeah, I do especially for the older boys, try to see what they're thinking on some things instead of just giving my idea all the time. Akrura Prabhu: And do you have experience that sometimes they give you something really, really amazing? Krsnendu Dasa: Yeah. Yeah, definitely. Krsnendu Dasa: Yes, especially I've got one of my son's he's got quite a creative thinking and he kind of thinks of things in a way that no one else would have thought of, yeah. Akrura Prabhu: I mean children can be really, really amazing source of ideas. Akrura Prabhu: Okay, 34, ask 'what if' questions of the people around you. Krsnendu Dasa: Did you do 33? I think we skipped 33. Akrura Prabhu: Oh, yes, 33. Express thanks both written and verbal at every opportunity. This is very important. Thank you for shifting me back. Important to express thanks. Oh my God, fantastic. We don't do this enough. Krsnendu Dasa: Yeah, I don't that's for sure. This is going great, this whole session. Even if this wasn't a podcast and no one else was hearing it, I'm getting so much benefit out of it myself just thinking "Ah, yeah, I can do this. I can do this." So many things that can help make my life better. It's really great. Akrura Prabhu: It's not only a technique for mentors or for bhakti-vriksha leaders or for counselors. This is like changing a culture of our lifestyle. Akrura Prabhu: 34, ask 'what if' questions of the people around you. Krsnendu Prabhu, what if you could give a talk for 2,000 people? What if everything goes well? What if you get another offer for 5,000 people? 35, ensure that you do not interrupt others when they are speaking. So in our conversation today, I tried to follow this. I made a couple of mistakes, but I try to not interrupt you and I hope to improve in this area. 36, take conscious steps to maintain a relaxed presence. Now we spoke about ease, so this is in relation to ease. No rush, no urgency, relaxed presence. 37, make a conscious effort to ensure that your position, authority, grade, seniority does not stop others from telling you what they really think. This is a tough one for ISKCON. Krsnendu Dasa: Yeah. Can you read it again from the beginning? Akrura Prabhu: Make a conscious effort to ensure that your position, authority, seniority or grade does not stop others from telling you what they really think. Akrura Prabhu: I have seen some gurus encourage their disciples to be very honest, give them very honest feedback about their class, about their dealings with others. And sometimes even after maybe a conversation with someone, when that person leaves then they ask them "So what do you think? Have I advise them well?" And then the disciple can say, "Well, maybe you could have set this too" or something. So this is in line with this that it doesn't matter that I'm in higher position, but I want to hear what you really think. Krsnendu Dasa: Yeah. That is tricky. I've seen that type of situation where the guru for example might ask that and may genuinely want to hear, but the disciple my feel "Oh, it's not my place to say anything." Akrura Prabhu: Yeah. But Prabhupada did that. He asked his disciples what do they think about something. Akrura Prabhu: 38, consider other people's physical comfort as important when they are with you. Again, this is about space, about the condition of their body. So we have spoke about this already. And Krsnendu Prabhu believe it or not we have only two more. We have done huge work here. 39, remain calm and relaxed when someone is openly expressing how they are feeling. Now I would like to take the opportunity to comment or glorify a devotee with whom I was working for six years at ISKCON London, it's Mahadyuti Maharaja. Every time he was a brahmacari when I worked with him and he would have me being present with him at various meetings and especially with ladies because he wouldn't want to speak alone with them as he is a brahmacari. He was a brahmacari. So I was present and I have never seen any, I was present and translating or being present with sannyasis, with gurus. But I have never seen anyone do this and it's such a such a sensitive act of, how do you say, consideration. So whenever the lady would come to talk to us, mataji, he would have a box of tissues. So like 90% of the time at some point the mataji would cry. Well, he would not say anything. He wouldn't preach, he wouldn't try to calm her down or something. He would just give her a tissue. And it helps much, you know, because your nose is wet, you're embarrassed and you don't want to get up and it's the only thing you need at that moment is tissue. So I was so pleased and impressed to see this because he is known as strict. He's known that devotees sometimes afraid of him but this was such a wonderful thing. I also in my conversations I tried to bring tissues also, although in my sessions people don't cry so much. But yeah, it's a wonderful thing. So, he remained calm, he remained relaxed, and he gave them a tissue. Krsnendu Dasa: Can you repeat what that one was? Remain openly calm and relaxed? Akrura Prabhu: Yes. When they are openly expressing their feelings, how they're feeling. Akrura Prabhu: And the last one is, 40, look for the strengths in those around you rather than the weaknesses. So again, this is being very encouraging, very supportive seeing the devotee who is a thinker in front of you as someone who is full of potential, who is sincere, who is capable and people can feel that and this helps them. Akrura Prabhu: Okay. So this is what we have done. So do we have any other comments or questions? Krsnendu Dasa: I was taking notes on every one as we went. Well, we've covered so much from the previous time. We were talking about the thinking sessions and the ten principles which have been basically expanded in these 40 thinking habits that we've gone into today. So yeah, I mean each one of these has got so much. Sorry. I'm not speaking into the mic... Each one of these has so much potential for making a difference in someone's life. It's been great. I'm just thinking what would be a good way to recall them. I mean it might be worth writing them down and flipping over a paper every day and looking at one habit a day for a month or so. Just to remind about this because we went through them so quickly. They are the sort of thing that's good to be reminded about. That was just one thought that came to mind. Akrura Prabhu: Well they are written form already. I will send them to you. Krsnendu Dasa: Yeah, that will be great. And what would you recommend, having heard what you've discussed up until now, what would be a good next step for a devotee that wants to put these into practice? Akrura Prabhu: I'm available. Anybody can contact me if they want to have a thinking session with me. They can have a thinking partnership with me or just practice once or twice and then start thinking partnerships with anyone they like. Akrura Prabhu: And I can send them the book. I can send them the link where they can read articles, hear the speeches about this by the author and I recommend three things: Learn and practice. Learn and practice. Learn and practice. Krsnendu Dasa: Three things, was that. Akrura Prabhu: Yes. So in this second session, I would like to mention my contact details. Akrura Prabhu: Because I want to serve devotees as a follow up to this session. Anyone who is interested, contact me on Gmail. My email is gitaseva108 at gmail.com. Gita as in bhagavad-gita, g-i-t-a, and seva, s-e-v-a. So it's all together, gitaseva108. It's all one word. My Facebook is Gita Seva, two words and I post inspirational quotes. I also post things related to this almost on a daily basis. Krsnendu Dasa: And you've posted all those question, to get people to think. Akrura Prabhu: What do you say before, I didn't hear everything. Krsnendu Dasa: Oh, sorry. I was saying that on your Facebook page you often will post questions to get devotees to think. Akrura Prabhu: Yes. Yes questions. I like to ask questions rather than telling people what to do because I like to stimulate their intelligence and their thinking. And this process is a very refined way of facilitating higher quality thinking and I think that all devotees will benefit from this. I'm also on Twitter as gitaseva, on Instagram as gitaseva, and I'm on Skype. My Skype is gitaseva108. Also, we can speak through WhatsApp and Viber but what number you can contact me, I can give you my number. So through all these social media, you can contact me and I can help you if you like to learn about this and practice with me or with others. Krsnendu Dasa: Yeah, that's a great offer and a great opportunity. I'm sure after listening to these couple of episodes that there'll be devotees who really think that well, I'd like to go further and learn more. And so it's very generous of you that you've offered your time and services to help devotees with that and it's a great service you're offering, very valuable. Akrura Prabhu: Thank you, Prabhu. All the materials I offer will be completely free of charge, but I will not refuse donations. 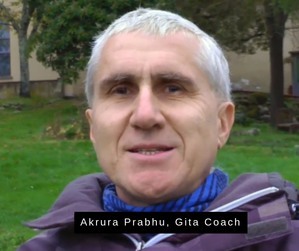 Akrura Prabhu: As a teacher and a coach. So I don't mind but it's not just it's not obligatory. Krsnendu Dasa: Yeah, and it's very generous of you Prabhu. I've known you for quite a few years now and I've always appreciated your positivity and your generosity and sharing things with me and with others. And so I just like to appreciate you for that. Akrura Prabhu: One thing that all listeners can help me with is that they can help me with their ideas how to Krishnize this system to the max. Because I'm just starting to develop it. I'm starting to Krishnize it and I already, when I asked some devotees for ideas I was really surprised that they gave me wonderful ideas, like different angles of how they see. And it will help to Krishnize it and to make it available for devotees for their service. Krsnendu Dasa: Yeah, that's a great idea because these principles are differently connected with the principles of Krishna Consciousness. It's just making that connection, making it obvious. So yeah, I really like that idea and hopefully we can hear from some devotees and start some discussion about how these ideas can be connected with Krishna Consciousness and you know seeing the origin in Krishna Consciousness too. Akrura Prabhu: Yes, exactly. So I want to say I ave a great haribol to everyone from Slovenia. Today we will have festival, Appearance Day of Lord Balarama and there will be many guests. It's raining for the last 24 hours non-stop. So I think devotees have been doing a lot of yagya and now the rain is falling as a result. So we cannot complain. But here devotees are renovating the temple room and they have huge Pancha Tattva deities. But at the moment they are not in the temple room because it's being renovated for their pleasure. And we have been getting a smaller place. But this yatra is amazing. Slovenia is two million people. They used to be the number one temple in small temples in book distribution and 1996 and they're always very well-organized and they have live broadcast from their temple and it's wonderful wonderful place for spiritual inspiration. Krsnendu Dasa: That sounds great. Well, thank you Prabhu, I hope you have a great festival with all of the wonderful devotees there and with the blessings of Lord Balarama. And I look forward to hearing from you again, and I look forward to hearing the feedback from the devotees who have heard these podcast episodes and how they apply them to help their own thinking as well as to help devotees in their communities. So thank you very much for sharing that with us Prabhu and let's be in touch. Akrura Prabhu: Thank you very much, Krsnendu Prabhu. I really appreciate your work with Successful Vaisnavas. I think it's a great, great service and many, many devotees are getting inspiration from this, from your work, from your service. From time to time some of my friends contact me and they say "Have you seen this?" And I say yes, I have seen it and it's great. So yeah, thank you for giving me an opportunity to share this tools for devotee's success. Krsnendu Dasa: Thank you very much. It's a pleasure and I think it's really valuable for everybody. So you thank you Prabhu and until next time, Hare Krishna. Krsnendu Dasa: Thanks for listening. To find out more go to successfulvaisnavas.com. Sri Prahlad: Whatever little service that anyone can do for Krishna is to be appreciated and celebrated. Jagattarini Mataji: Just give this life to Krishna. Akrura Prabhu: We know that they have much more potential than they're presently using. Urmila Mataji: I went to a place of relishing the activity and letting go of the results completely. Srila Prabhupada: You just associate with pure devotees then you shall be able to cross over the ocean of nescience.